Researchers are studying the events leading to the formation of tumors in pancreatic cancer to understand the beginnings of the disease. This may lead to early detection and treatment of the disease. Pancreatic Carcinoma (cancer of the pancreas) is one of the most difficult of cancers to treat. This type of cancer is usually detected in its later stages making recovery from it difficult to impossible. 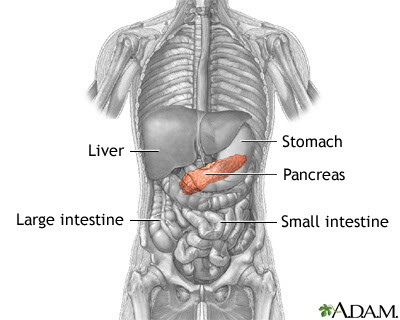 The pancreas is a long gland that secretes digestive enzymes and the hormones insulin and glucagon. What makes detection for cancer of the pancreas difficult is that the gland is located behind the abdomen which is difficult for instruments to get to for observation. Most of the symptoms for pancreatic cancer is nondescript such as mild pain, weight loss, fatigue and weakness, and loss of appetite. It is only when the symptoms progress that the disease is evident. One telling symptom is jaundice which is a yellowing of the eyes and skin. This happens because the bile duct is being blocked by the cancer. The disease is slightly more common in women than in men. People with diabetes, smokers, and those with chronic pancreatitis are more at risk with this disease. Because the cancer is detected at later stages, surgical removal of the cancer is usually not possible. The standard surgical procedure is called a pancreaticoduodenectomy (Whipple procedure) where the head of the pancreas where most of the tumors originate is removed. A diagnosis of pancreatic cancer is particularly devastating since the prognosis for recovery is usually poor, with the cancer most often not detected until late stages. Research led by scientists at the University of California, San Diego and UC San Francisco Schools of Medicine examined the tumor-initiating events leading to pancreatic cancer (also called pancreatic ductal adenocarcinoma or PDA) in mice. Their work, published on line November 29 in the journal Cancer Cell, may help in the search for earlier detection methods and treatments. "Previously, it was believed that this cancer arises from the epithelial cells in pancreatic ducts," said Maike Sander, MD, professor of pediatrics and cellular and molecular medicine and director of UC San Diego's Pediatric Diabetes Research Center, co-principal investigator of the study along with Matthias Hebrok, PhD, director of the UCSF Diabetes Center. "But in this study, we show that ducts have almost no response to oncogenic mutations – mutations that give rise to cancerous tumors." The study revealed that another pancreatic cell type, called the acinar cell, converts into a duct-like cell that initiates tumors. The researchers also showed that inflammation of the pancreas, which is a significant risk factor for pancreatic cancer, promotes the conversion of acinar cells into duct-like tumor precursors. Kras is a gene that may cause cancer when it is mutated. It makes the Kras protein, which is involved in cell signaling pathways, cell growth and apoptosis, or cell death. Agents that block the activity of the mutated Kras gene or its protein may stop the growth of cancer. Tracing specific cell populations in the presence and absence of tissue injury in mice, the research team demonstrated that oncogenic Kras can readily induce PDA precursor – or premalignant – lesions called PanIN, from adult pancreatic acinar cells, but not from ductal cells. Accounting for the fact that acinar cells are more abundant than ductal cells in the adult pancreas of mice, the difference in the ability of the acinar cells to generate PanIN premalignant lesions remained more than a 100 times greater than the ability of ductal or so-called centroacinar cells. In addition, the study demonstrated that, when PanIN lesions originate in acinar cells, they activate the ductal transcription factor Sox9. The scientists show that activation of Sox9 is necessary to convert the acinar cells into premalignant lesions. Overexpression of the Sox9 gene enhances both abnormal, pancreatitis-associated changes in adult tissue cells and Kras-induced PanIN formation. Ductal and centroacinar cells already expressing Sox9 are dramatically resistant to Kras-induced neoplastic transformation, which is the conversion of a tissue with a normal growth pattern into a malignant tumor. The findings demonstrate a key role for acinar cells in the beginning stages of pancreatic cancer, and point to Sox9 as a potential target for preventing early tumor-initiating events.